If you’re in between, average it out. The amount of dill isn’t critical: just cover the filets like you’ll see in the pictures below. 1 tablespoon = 3 teaspoons = ~45 ml. A plate large enough to hold the salmon. If it came in a plastic tray, rinse it and use that. Measuring spoons. Don’t fake this: it is very important to get the proportions right. 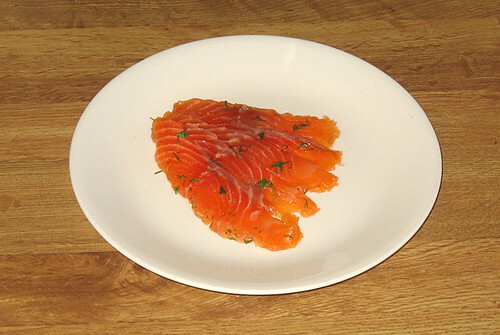 Gravlax: Step By Step Directions, With Pictures! Step 1: Unwrap the filet, rinse it gently, and pat it mostly dry with a paper towel. Step 2: If there’s a very thin part on one side (this is the belly), trim it off. Save it and eat it later, as it’s delicious! Try to trim the filet so the two ends are nearly symmetrical. You'll see why later. Step 3: If you bought a single filet, cut it in half as precisely as you can. As if using white sugar wasn't evil enough, I bought it at Wal-Mart. Then I ate a baby. 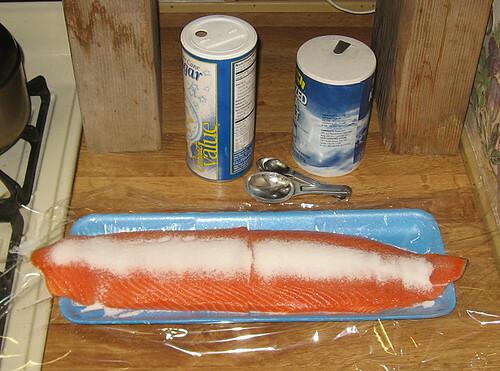 Step 4: Place a layer of plastic wrap on top of the plate (or the plastic tray, if you saved it) that you’ll be curing the gravlax on. 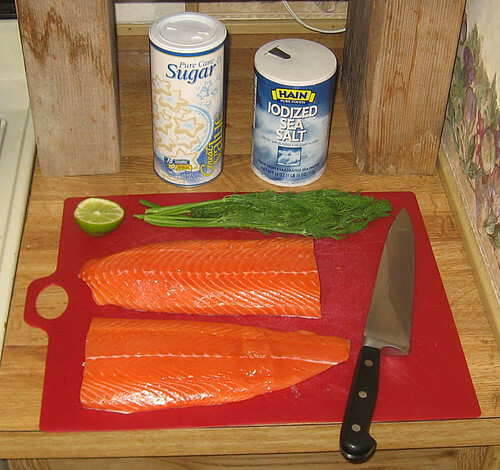 Then put the salmon filets on the tray. If you skip this step, you will make a big mess. Step 5: Shake the salt and sugar over the thick parts of the filet. Don’t try to go all the way to the edge: it’ll soak through as it cures. Use more salt and sugar on the thick end of the filets, and less on the thin end. Just shake the salt and sugar right out of the measuring spoons. Step 6: Mince the dill. Most recipes tell you to leave it whole, but you can use a lot less if you mince it—and I think gravlax tastes better with a few dill bits left on it. Step 7: Distribute the dill over the filets. Step 8: Cut three thin lime slices. Dice the slices and put them on top of only one of the two filets. (You’ll understand why in a moment.) Use slightly less lime than I used in the picture: this is a bit too much. It is important that the lime bits don’t touch the fish, or they’ll make little white acid burns. This is why you can’t use lime juice. Strictly speaking, the lime isn't traditional...but it tastes much better. If the table calls for 3 lime slices, zest about 1/2 lime. 6 lime slices = zest an entire lime. In between? Average it out. If you don’t have a zester, or don’t know what a zester is, don’t worry…this is just a time-saver for people with lots of kitchen gadgets. Step 9: Take the dill off of the other filet and put it on top of the filet with the limes. Remember, you need to keep the lime bits from touching the fish. You'll understand in a moment why I do things this way. 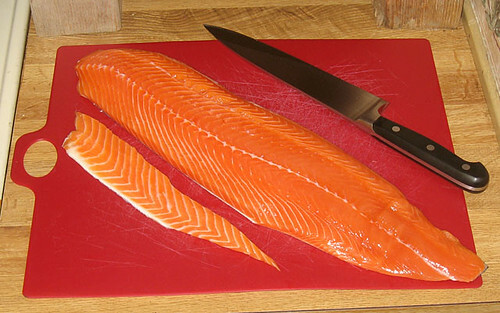 Step 10: Make a big salmon sandwich by putting one filet on top of the other. This is why you put most of the ingredients on one filet: if you try to tip one filet onto the other while it’s covered in dill and lime bits, you’ll make a huge mess. Step 11: Wrap the filets as tightly as you can in the layer of plastic wrap you put under them. Step 12: Wrap the filets in at least two more layers of plastic: one around, one lengthwise. Wrap as tightly as you can: you want the filets to be touching each other at all points, with no air space. The easiest way is to lay a few big sheets of plastic wrap out on the table and roll them up. This photo was actually taken after curing, but it looks the same. Step 13: Put the filets in the refrigerator. Make sure they’re on the tray or plate, because they’ll leak no matter how well you’ve wrapped them. Step 14: Traditional recipes tell you to put a weight on top of the filets while they’re curing, and to remove and re-baste them during the cure. This isn’t necessary if you’ve wrapped them tightly…but you do need to turn them over a couple times. I flip mine morning and evening. Unlike most recipes, curing time doesn’t need to be exact…it’s OK (though not perfect) after 36 hours, and I’ve left it to cure over three days and it tasted the same. And now, the delicious part! 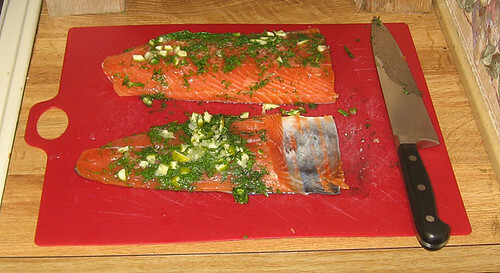 Scrape the dill and lime debris off the top, and slice the gravlax as thinly as you can. For best results, slice diagonally so that you get the largest slices possible. If you’re feeling frisky, you can present it nicely: it’s traditional to serve gravlax with a dill and mustard sauce (non-Facebook link) on crisp bread, often topped with a squeeze of lemon, a few capers, and some white pepper. (Another delicious suggestion involves lemon zest, orange zest, and juniper berries.) But as I am a bachelor and eat a paleo diet, I usually just stand over the cutting board and pop the slices straight in my mouth. ...and serve! This will last me approximately eighteen seconds.